Haven't been on the forum for 16 months. Interested to know who your dad was. Maybe the old man has mentioned him to me in the past. Dooks passed away 40 years ago, this August coming. If you get this message send me a text. Hi Billy, I found your message just by sheer luck because you didn't send me a personal message via the regular way. I will tell you what you want to know, if you can do that through what they call the inbox. So you click on my name and send me a PM. I'm a bit loathe to reply here because I don't know where it ends up and if it stays confidential and the Personal Messages are. Came across your article about the place cards. My name is Billy, and I'm one of Dook's sons.The old man was a legend as you have stated. I used to check the cards with my Grandmother Sarah as a little boy after the last on Saturdays.Just wondered who your dad was? I could write a book about what I've seen and what the old man taught me. 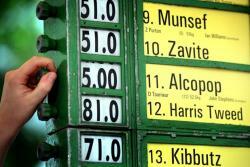 He was bloke who was my best mate, and the probably the best horse punter the world has seen. He's the only person who won at the caper over a 50 year period, and never gave it back.It was his sole source of income. No big factory or business to supplement the punt,unlike many others. I asked him one day, why don't you attack one bookie.Answer, everyone has got kids to feed, you don't target one, you get em all for bits. Why would you want to put someone out of the game? Wipe one out, it's one less in the ring that you can't get. Don't take unders and percentages are everything. Leave you to work that out. Good luck, Billy.